I can’t believe I’ve been blogging for this long (i.e. more than three hours) without mentioning my love for Black Phoenix Alchemy Lab perfume oils. I’ve been collecting them since 2009, but focusing on them never left me enough discretionary cash for their sister site, Black Phoenix Trading Post. But during their Halloween update last year, I finally got to try one of their hair glosses and absolutely loved it. I was really excited to get more, as they had some exclusive scents for New York Comic Con, but I was working there as a crew member and unfortunately when I was finally free to explore the con off-duty, both of them had already sold out. I may or may not have outwardly cried. For hours. ahem. But here is the one I bought last year, Lightning Storm! 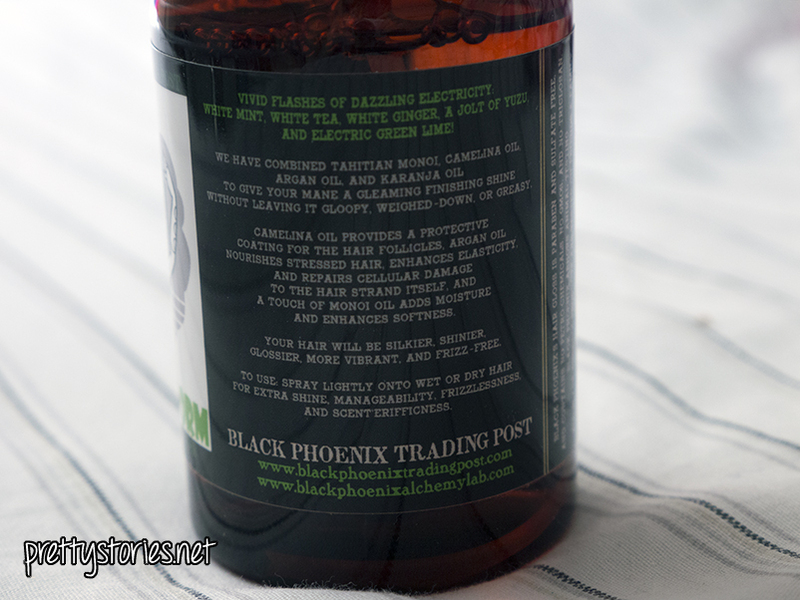 Vivid flashes of dazzling electricity: white mint, white tea, white ginger, a jolt of yuzu, and electric green lime! I am all over citrus-y, minty fresh type scents, and this is exactly that. At first it’s mostly the lime and mint with a hint of sweetness (the yuzu? ), but after wearing it for a while, the scent warms up, bringing out the tea and ginger. And it lasts until the next time I wash my hair! It does fade, but I still catch whiffs of it when doing things like removing a hat or taking my hair out of a ponytail/bun. But does it actually do anything for your hair? BPTP’s hair glosses contain monoi, camelina, argan, and karanja oils. I apply it by spraying the product into my hands, and then running my fingers through my hair. I feel like that distributes the product more evenly, and lessens the chance that I’ll accidentally point the nozzle at the wall (why do i keep doing that). A little goes a long way – I only use this a few times a month because I will be super sad when it runs out, but as you can see there’s still plenty in my bottle. I definitely notice a difference; before I cut my hair, the ends were brittle and had a sort of crunchy feel to them after washing. The hair gloss softened my hair an incredible amount, and I had fewer tangles to comb out, plus my hair was super shiny. And smelled delicious. I used it right before getting my hair cut so my stylist would judge my fried, breaking mane less, even though I was getting a shampoo there as well. >___> It says you can spray it on wet or dry hair, but I didn’t really like using it when my hair was dry. I found that when doing so, even though my hair doesn’t feel weighed down after using it, it flattens a bit – my hair naturally is slightly wavy, and I prefer the way that looks on me to pin-straight hair. The results are fantastic when I use it on damp hair, though. Definitely something I plan on keeping in my arsenal of hair products. 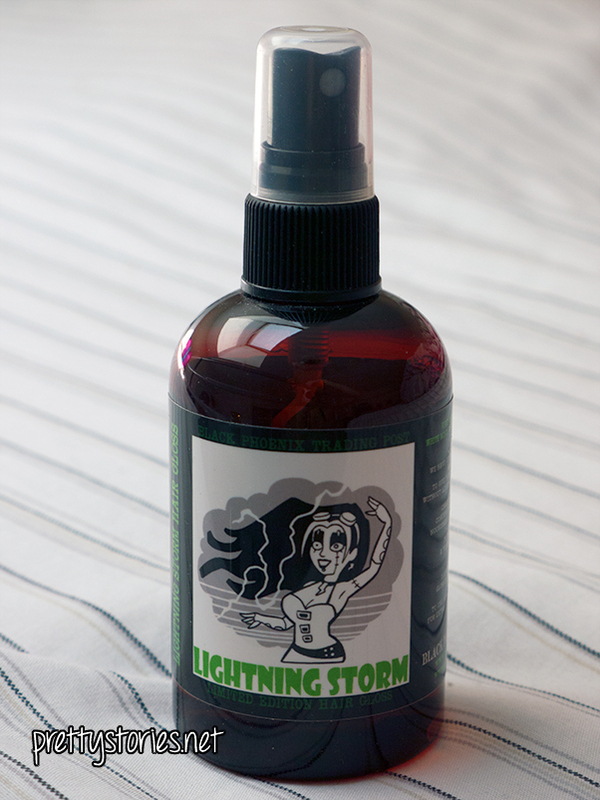 Lightning Storm was limited edition and is no longer available, but the hair gloss comes in other scents and can be purchased for $30 plus shipping on the Trading Post website. I highly suggest Dorian; I’ve never tried the hair gloss form, but I wear the perfume oil all the time and it’s one of my favorites. I have been known to get a whiff of myself after applying it and exclaiming aloud, “Yo, I smell really good.” My boyfriend thinks that is weird. I think he is weird. The Halloween 2014 collection is also live right now, so if you’re into Pumpkin Spice Everything, they’ve got a hair gloss! 😀 😀 I am probably going to grab one of those myself. Disclaimer: I bought this item with my own cashmonies, and this review is entirely my opinion/experience, not sponsored or otherwise affected in any way.